Windows have a bigger impact than you might think. They affect the way your home looks on both the inside and the outside, and they play a big role in how well your home regulates energy. Choosing the right windows can improve the look and feel of your home and increase its value. Vinyl windows come in a wide variety of colors and styles. You can find vinyl windows to improve the profile of any home. You can even find vinyl windows that mimic the look of wood or other materials. With vinyl windows, you can create a sleek, modern design or you can choose a rustic, country look. Just choose the size, style and color that you want. You can work with an interior designer to choose the windows that will create the best look for the inside and outside of your house. Vinyl windows do not require any maintenance outside of keeping the glass clean. Other windows need to be scraped, repainted and sealed to keep them in top shape. Otherwise, they will rot, rust or warp. Vinyl windows are not susceptible to temperature changes, nor will they rust or rot. You can count on consistent performance from vinyl windows year after year. 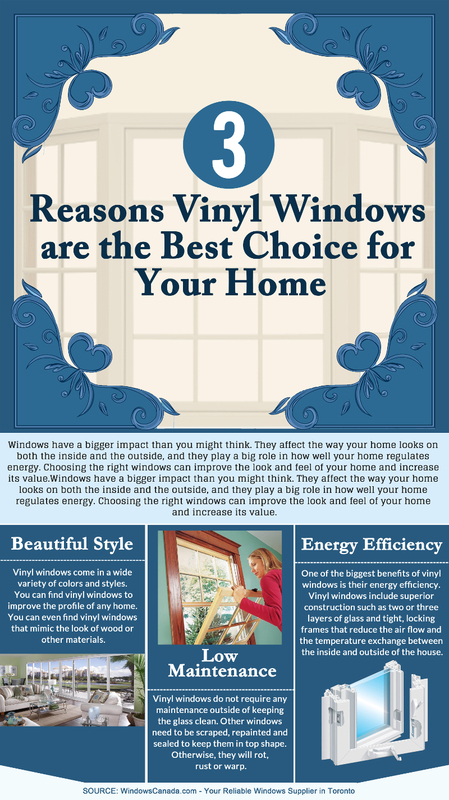 One of the biggest benefits of vinyl windows is their energy efficiency. Vinyl windows include superior construction such as two or three layers of glass and tight, locking frames that reduce the air flow and the temperature exchange between the inside and outside of the house. Vinyl windows help to insulate your home, keeping hot air out during the summer and keeping it in during the winter. Installing vinyl windows will help you to lower your overall energy costs, saving you hundreds of dollars per year and thousands of dollars over the life of the windows. Vinyl windows are the superior choice for your home, no matter its size. If you are ready to upgrade your windows, click here to check out this offer for replacement windows in Markham. You'll find great deals on a wide selection of stylish and high quality vinyl replacement windows.